With fresh local ingredients in abundance, cooking up a storm could just be the ultimate island pursuit on New Caledonia. Writes Marnie Clarke. Olivier is telling me how he comes up with his recipes. Such vision, coupled with passion and a commitment to quality, makes the French-trained chef an inspiring cooking instructor. 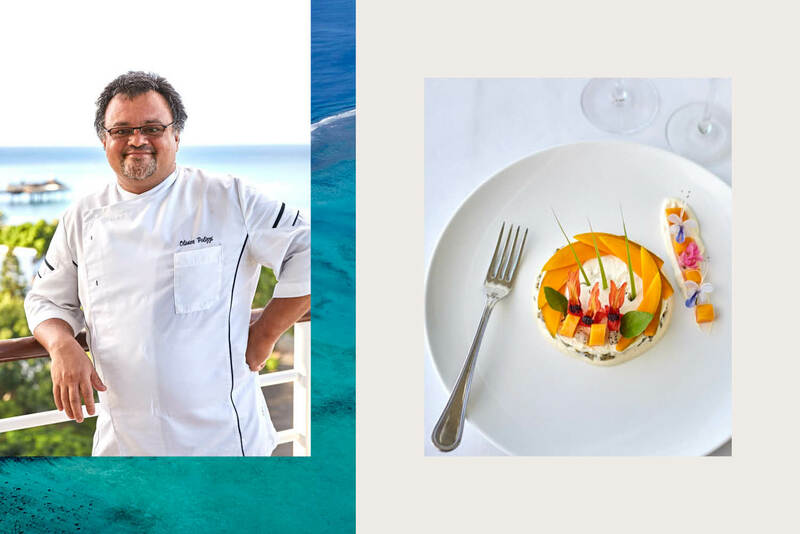 It also makes him a worthy culinary ambassador for New Caledonia, whose location, perpetually spring-like climate and island topography ensure a diverse bounty of world-class food, including tropical fruits, vegetables, seafood, meat and aromatics such as vanilla. 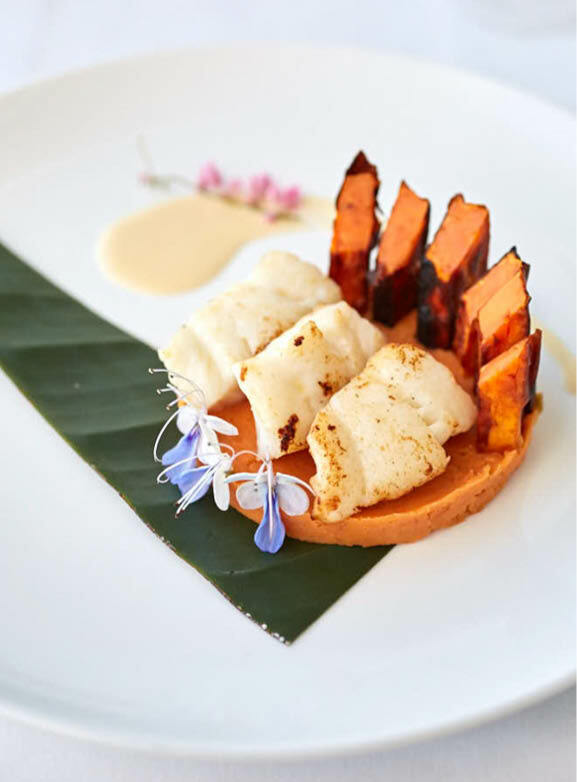 Olivier and I are chatting in the kitchen of a three-bedroom suite at the Hilton Noumea La Promenade Residences as we work together to create a three-course seafood-inspired dinner. His menu comprises an entrée of juicy grilled prawns with guacamole and mango, a main of pan-seared trout with sweet potato fries, and a simple dessert of diced fruit with crème pâtissière and biscuity chocolate soil. All the fresh elements are locally sourced and seasonal. Bright and elegant yet uncomplicated, the meal is typical of Olivier’s approach to his work: let beautiful ingredients speak for themselves. 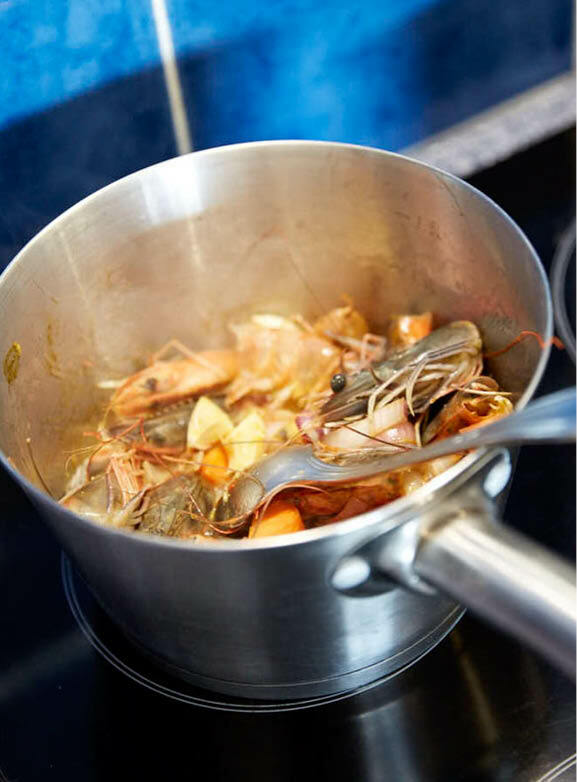 The private in-room cooking class has been offered as part of a partnership between the Hilton and the culinary-focused Noumea bed-and-breakfast Lézard Home to promote Caledonian cuisine and give guests a food experience to remember. Owner Sonia Clavel says the classes enable participants to discover French cooking with a French-trained chef. “It’s interesting for cooking lovers,” she says. “It brings you a bit of technique that you can do at home to impress your friends.” Olivier agrees. “When you are passionate about cooking, it’s good to learn with a chef because we know how a kitchen works,” he says. “That’s our job.” I’m quite happy to help with the easy stuff, though, such as peeling and chopping, and simply enjoy watching a professional in his element. Olivier is pan-frying the truite saumonée, a flaky white local fish known for its consistently high quality. “It’s one of the best fish you can get here,” he tells me. “It’s reliable. It will always be the same, whether you catch it today or next week, so it’s good for chefs.” The Caledonian prawns are just as good; apparently they are exported to Japan, which is really saying something. “For the fish and the prawns, always use hot olive oil with a touch of butter, so they sear immediately and keep their saveur,” Olivier says. Oui, Chef! The next task, then, is dessert. At one stage I wonder aloud if the chocolate soil is burning but he peeks in the oven, sniffs the air and declares that everything is fine. All work finally done, we share the meal in the balmy evening air on the balcony overlooking Anse Vata bay. The mildly sweet and meaty prawns are balanced by the cool and creamy avocado and luscious mango flesh. The fish is, quite simply, divine. And, for a memorable finish, the fresh fruit – banana, passionfruit, and dragon fruit grown in Sonia’s garden – contrasts with Olivier’s rich, sweet crème pâtissière flavoured with vanilla from Dumbea, just north of Noumea. On top are those chocolatey crumbs, not burnt at all. It’s heavenly stuff. “Caledonian cooking is a mix of cultures, a mix of saveurs and cuisine,” Olivier says. “That’s gorgeous.” Indeed.